Thin-cut pork escalopes are perfect for a speedy supper, and the velvety-soft puréed butter beans here make a change from regular mash. 1. Place the pork escalopes in a large shallow dish. Add the oil, garlic, thyme, lemon zest and half the lemon juice, and massage into the pork. Set aside to marinate for 5 minutes. 2. Meanwhile, place the beans in a large pan of boiling water. Bring back to the boil and simmer for 5 minutes until piping hot. 3. Grill the pork escalopes under a high heat for 5 minutes on each side until lightly browned and cooked through. 4. Meanwhile, place the chilli in a food processor and whizz to form a paste. Reserve 5 tbsp cooking water from the pan containing the beans, then drain. Add the beans and reserved water to the food processor and whizz to make a coarse purée. Stir in the parsley and season to taste with the remaining lemon juice. 5. 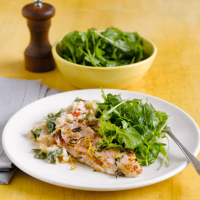 Divide the butter bean smash and grilled pork between 4 plates and serve each with a large handful of rocket leaves.